When I first saw the Mercedes-AMG GT, I have to admit that I was a little underwhelmed. Without the SLS's gullwing doors, it was a pretty shape, but felt like it was missing something. 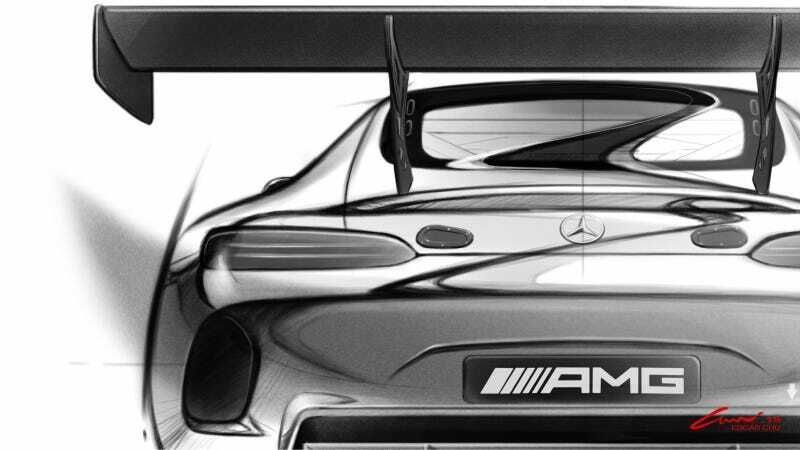 Now Mercedes will make a GT3 version, and that's all been fixed in the sketches. Everything looks better in GT3 trim! This GT3 race car, however—this has a real wing. Problem fixed. This sketch also gives it muscular vents, wide wheel arches, intakes and bulges that make the no-nonsense GT better in every single way. Yes, I am, in fact, mentally twelve. And yes, please make one in neon chrome ridiculous livery, thankyouverymuch. With asplosions! Neon chrome ridiculousness with ASPLOSIONS and SHARK LASERS, please. Evo states that the weight will be cut down to around 2,650-2,850 lbs (as opposed to the stock 3,461 lbs) and power will be capped at around 500-600 bhp to compete in the class. GTspirit mentions that this will only be a customer race car, with no factory GT3 race program in the works. This inevitable improvement of the Mercedes-AMG racer will race against all the other wonderful things that compete in the GT3 category: Nissan GT-Rs, McLaren 650Ses, Bentley Continentals, Audi R8s, and Aston Martin Vantages, to name a few. The BMW M6 and Lamborghini Huracán aren't far from joining in with GT3 racers, either. It's a good time to be a fan of the GT3 category. Just look at how crazy the Bathurst 12 Hour ending was: seven different cars in the top seven at the end. With Pirelli World Challenge allowing GT3 cars now and TUDOR United SportsCar about to adopt the standard for GTD, I fully expect to see someone bring this Mercedes-AMG GT3 here in America, in the sheet metal. According to Evo, the Mercedes-AMG GT3 will debut at the Geneva Motor Show on March 3.